Meluka Yusuf competed in her very first JD XC race and faired well for her first outting. Lauren Vanee had a bit of hard luck when she took a tumble and did not finish. But congrats to all our competitors! 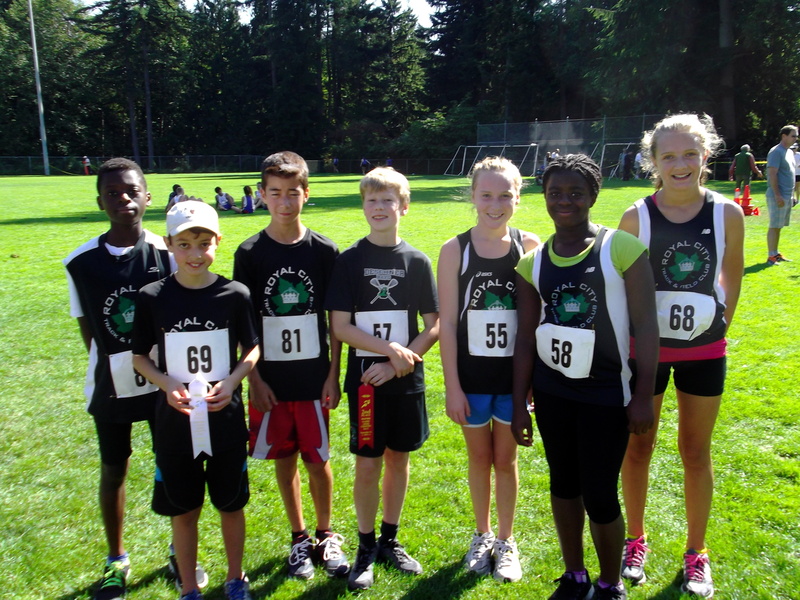 The RCTF squad was at The Pinetree Classic Race this past Saturday September 15th at Mundy Park in Coquitlam. A beautifully warm and sunny day greeted Royal City’s XC squad to kick off an eventful running day. In their 2.5km race, freshmen runners Shea Janke and Grace Fetherstonehaugh had a great first time out with Shea taking 2nd place in the 11 year old boys group and Grace coming in 4th place for her girls age group. Veteran club runner, Jeremy Belcher, came in 3rd place right behind Shea in the same group. Other veteran runner, 13 year old Emily Chilton, came in a very strong 4th place in her 3.5km race. Ian Hunter, Emmanuel Dadson and Michelle Dadson gave good strong efforts with Ian finishing 8th, Emmanuel 9th and Michelle 12th place for their age groups. The Royal City XC Teams’ next event is 22nd September at Bear Creek Park in Surrey. For those athletes interested in participating in our cross country season – it starts the week of September 10th! Training will be Mondays and Wednesdays at Cariboo Park which is on the corner of 10th Avenue and Cariboo Road from 5:30 – 6:45. Meet in the playground area. This training is included for all our competitive athletes. Those that participated in Intro to Track are welcome to join X-Country but will need to pay the difference between the Intro rate and the competitive rate ($50) plus the BC athletics upgrade to competitive if they plan on competing. For new athletes joining Cross Country, the cost is $100 for the season. Please download the 2012 Registration and Waiver Form XC. It was an injury filled weekend at the 2012 BC JD Championships in Richmond with top athletes Megan Lauener, Lauren Vanee, and Anaiyah Bernier all suffering injuries that eventually made them pull out of competition. But there were some break through performances as well, particularly with the Royal City javelin throwers. Most all of the athletes threw the javelin and broke personal bests by great margins. Leading the pack was 11 year old Jeneviève Patry-Smith with a throw of 24.03m which places her in the top ten of all time and meeting the BC award standard. Also of note in javelin were 10 year old Michael Baxter throwing to second place, Maxwell Jones finishes 5th in the 11 year old boys, followed by a 7th place for Ryan Jensen. Ian Hunter picked up 5th in the 12 year old category joined by Brianna Bates equalling the performance on the girl’s side. 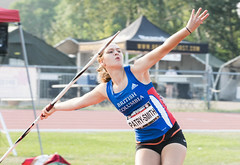 In the other throwing events, Jeneviève Patry-Smith was consistent in picking up silver medals in both the shot put and discus, throwing personal bests in both events with a 22.38m in discus, a centimetre shy of the BC award standard. Michael Baxter also placed 2nd in the shot put for the 10 year old boys. And Michelle Dadson proved her discus throw at the Trevor Craven was no accident by winning the silver medal for the 10 year old girls. Finally, Ryan Jensen picked up a pair of sixth place ribbons in both the shot put and discus. The Royal City runners also did well with 10 year old Anaiyah Bernier finishing 8th in the 100m and 5th in the 60m. Of the same age, Michelle Dadson finished 5th in the 100m and 8th in the 60m hurdles. And despite injury, Megan Lauener was still able to pick up a 3rd place finish in the 60m hurdles in the same age group. Katie Stewart-Barnes won silver in the 9 year old girl’s 600m. At the 11 year old boys’ category, Maxwell Jones had a pair of 5th place ribbons in the 60m and 60m hurdles. He also placed sixth in the 100m. Ryan Jensen came 8th in the 60m hurdles. Dominating the sprint track was 12 year old Emmanuel Dadson with a 7th in the 80m hurdles and a bronze medal in the intensely competitive 100m. But Emmanuel would settle for none other than a gold medal in the 200m with a blistering personal best run of under 28 seconds. Joining Emmanuel in the 100m finals was rookie 100m finalist, Ian Hunter, who finished in a respectable 7th place. Ian also finished 5th in the 300m. 11 year old Ryan Jensen joined older team mates Ian and Emmanuel to form a 4×100 team and won gold. In the longer distances, Royal City also showed dominance. Emily Chilton lead the charge with a gold medal performance in the 13 year old girls’ 2,000m. She continues to dominate in the event with her smartly orchestrated racing. She was joined by Taylor Morrison, Brianna Bates, and Amanda Scott to place 3rd in the 13 year old medley relay. Other distance finalists were 11 year old Ryan Jensen with a 6th in the 1,000m and a bronze medal in the 800m race walk. 12 year old Ian Hunter came 5th in the 1,200m. Rounding out the weekend on the jump aprons were Katie Stewart-Barnett with a gold medal in the 9 year old girls’ high jump. Ian Hunter captured a bronze medal and a personal best jump of 1.35m in the 12 year old boys’ high jump. For the 11 year old boys, Max Jones and Ryan Jensen traded places in the long jump and high jump with 7th and 8th place finishes, respectively. 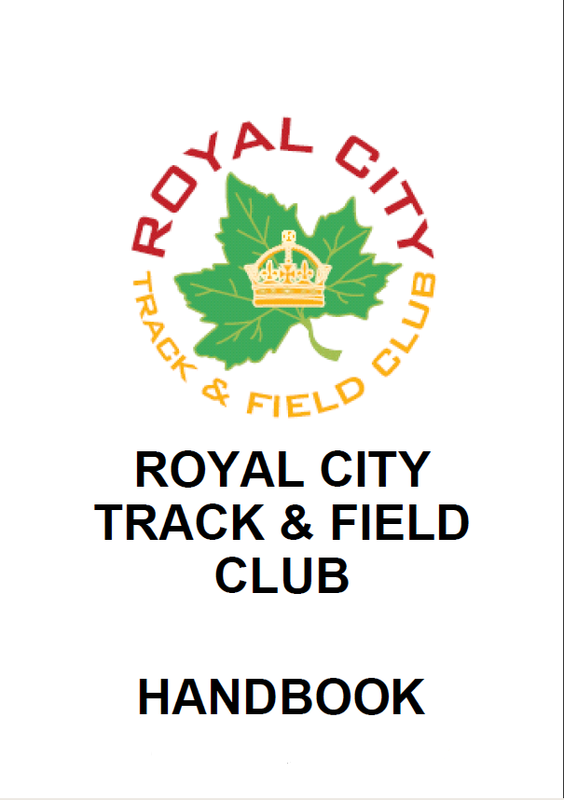 In summary, Royal City continued to prove itself as one of the best all-around junior developement track and field clubs in the lower mainland.